North Star of Texas Writing Project Teacher Consultants have agreed that the following patterns represent our work together. A group of TC’s presented this work at the National Council of Teachers of English Arts (NCTE) National Conference in November 2013. Each blogged about their topic and the link is included below. In an inquiry approach classrooms become communities who engage in dialogue with the past in order to meet the future. As teachers ask questions about their own classroom practices, they model inquiry for students. Students in inquiry-driven classrooms do not simply answer questions but learn to pose their own questions. Inquiry invites teachers and students into an authentic discourse community that values everyone’s voice. 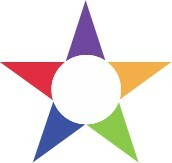 In this way, North Star prepares students to enter and contribute to academic conversations in all fields. Dialogue is the appreciation of all the voices in a conversation. In schools these voices include: administrators, parents, teachers, and students speaking and listening, hearing and responding to each other meaningfully. in classrooms this includes engaging students in rich conversations with the teacher and each other. This type of dialogue posits each voice as an equal member with a valid contribution. Through meaningful dialogue relationships are built and multiple perspectives are considered. Conferencing with students is an prime example of dialogue. Authenticity becomes a norm as teachers flatten their classroom walls and help students see that their voices matter. Students begin to take ownership of their learning and move toward becoming active and empathetic global citizens. Authenticity blends academic reading, writing, listening, and speaking experiences with real-world applications, which created genuine desire in learners. Choice, audience, and purpose matter and extend beyond teacher-centered reading and writing experiences in the classroom. Students determine and establish relevant and “worthy” inquiry; teachers provide resources, opportunity and time for students to delve deeply into ideas, ultimately becoming the teachers of their content. Integral to literacy instruction, modeling occurs when teachers come alongside their students and actively model and share both mentor texts and their own writing to support student writing. Following a gradual release model the teacher demonstrates the struggle and expectations of the writing project before working alongside the students to create a shared example. Only after these models are provided and extensive support is offered via conferring and scaffolding, the students work to create their own writing. This approach utilizes an apprenticeship approach for writing instruction. Re-visioning is an iterative design process that helps a community see, understand, and influence patterns. A teacher might design a lesson focused on introductions after assessing a class set of essays or show a specific student a different mentor text in a writing conference. As an instructional design process, re-visioning is utilizing assessment and feedback to meet the needs of individual learners and to build coherence throughout the learning community. We help writers and educators not only “revise,” fix what is not working, but “envision,” see what is possible in our words, our stories, our lives, our communities, and our world. Writers not only know the power of revision but the importance of envisioning possibilities. 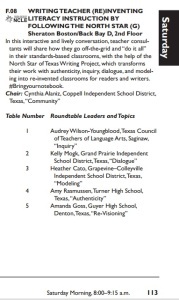 North Star of Texas Writing Project works toward re-visioning our writing, our classrooms, and our schools. Community is about building an ongoing equitable, participatory culture of relationships: teacher to teacher, teacher to learner, teacher and learner to reading and writing, expert to teacher and learner. NSTWP commits time to understand our common beliefs and acknowledge important differences, thereby encouraging risk-taking, iteration, and innovation through a transparent exchange of inquiry and reflection for both educators and students. Cultivating community means valuing individual voice and assets to create innovative solutions that advance all members of the system of learners.